On November 8, H.E. Mme. 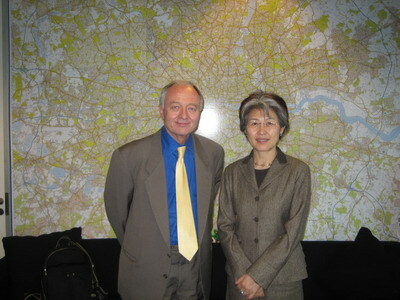 Ambassador Fu Ying met Ken Livingstone, Major of London, in the City Hall of the Greater London Authority. They discussed the cooperation between the two countries in city development. Livingstone introduced that London would hold the 2012 Olympic Games after the Beijing Olympic Games and were preparing for the construction of relevant venues, but could not find enough satisfactory or appropriate construction companies in the public bidding. The <?xml:namespace prefix = st1 ns = "urn:schemas-microsoft-com:office:smarttags" />UK public and he himself had a deep impression on the efficiency and quality of such construction projects as the Olympic venues in Beijing and Shanghai subway system. London welcomed the Chinese construction companies or real estate developers to actively participate in the bidding for the construction of the Olympic venues in London. Livingstone denoted that the Greater London Authority had made a "20-year Reconstruction Plan" and planned to greatly improve the infrastructure in the East End of London by making use of the opportunity of holding the Olympic Games so as to bring along the rejuvenation of the whole East End. The improvement includes the upgrading and facility replacement of the 7 existing subway lines, construction of 118km new railways going through London from the east to the west, and building of 200,000 new houses. The annual investment of each of the above three projects will be more than 1 billion pounds. Livingstone also introduced that Venezuela thought highly of the successful experiences of London in the urban planning and traffic administration and had invited the Greater London Authority to participate in the reconstruction of Caracas, Capital of Venezuela. Venezuela has enough funds while UK is good at design and planning, but both sides lack qualified and powerful construction companies. It is hoped that the Chinese enterprises can participate in the reconstruction of Caracas together with London. Fu Ying thanked the introduction of Livingstone and denoted: the Chinese construction enterprises and engineering companies have accumulated abundant experiences in the building of the Olympic venues and municipal construction and had relative international competence. The Chinese Embassy in the UK is willing to act as a bridge so as to transfer relevant information and invitation from the UK side, recommend more Chinese enterprises to carry out business in UK and make contributions to the success of London Olympic Games and the development of London.